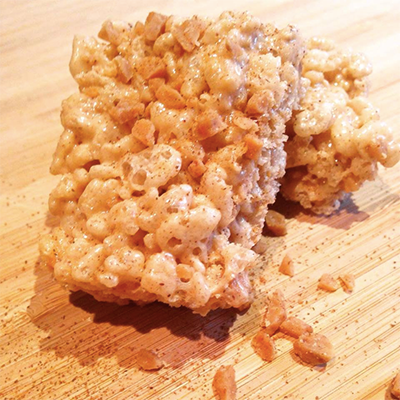 Rice Krispie Treats are a classic. They are such a go-to item for me to bake with my daughter because they are super easy and safe for her to make (almost) unsupervised. We kicked this batch up with some new ingredients and they turned out extra special. If you are a lover of all things cinnamon (like I am), these may become your new fave way to make these nostalgic treats. Grease a 9×13 pan with butter. Place marshmallows and butter into microwaveable bowl and microwave for 1 minute at a time (stirring after each minute) until melted. Add toffee bits, vanilla and cinnamon and stir to combine. Pour marshmallow mixture over Rice Krispies and stir (do this quickly) until well combined. Press into greased pan (I use a sheet of parchment paper to help press the mixture down firmly without sticking to my hands). Let cool, cut into squares and share with someone you love.